Trump Blames Susan Rice In Alternate Narrative To Russia Storyline It took a while to get going, but the White House has settled on its alternative narrative to potential connections between the Trump team and Russia's meddling in the U.S. election. Congress and the FBI are looking into Russian election interference and Trump team ties to Russia. In former national security adviser Susan Rice, Republicans have found a familiar foe. President Trump has tried to turn attention related to the investigation of Russian meddling in the U.S. election toward her. After false starts and odd twists in the White House's counternarrative about the potential connections between President Trump's campaign and Russia's electoral meddling, the storyline has settled into a familiar arc: It's all Susan Rice's fault. 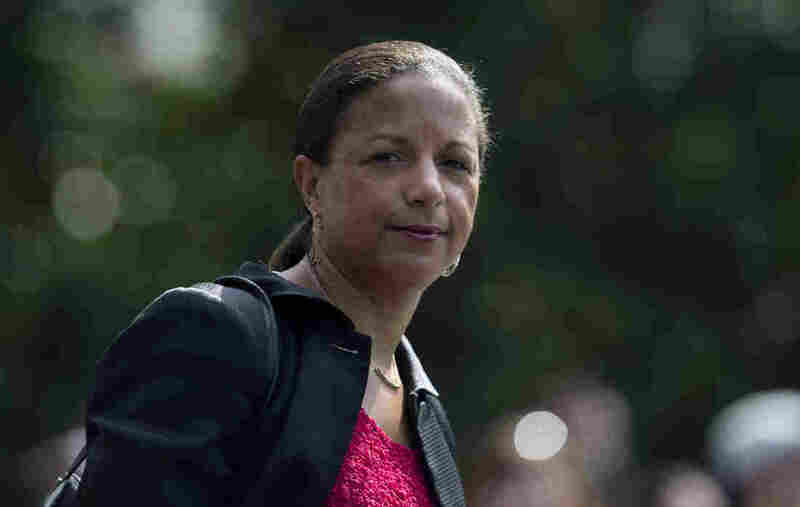 The White House charges that it was Rice who may have abused her power as President Barack Obama's national security adviser and effectively snooped on Trump's presidential transition. It was Rice who may have leaked classified details from that surveillance to the press, it alleges. And in doing so, Trump mused on Wednesday, she might have committed a crime. Now it's all there: The plot and the villain and the quest for a predicate to drive the story forward. Who will investigate? What's to be done? Rice is probably not in any legal trouble, and she denied any improper behavior or leaking any information while working in the White House. But she has been a favorite target for Republicans for years, and bringing her back into the headlines reprises a familiar antagonist they love to hate — a crowd-pleasing Darth Vader cameo in an untested Star Wars spinoff. Rice, in the Trump construction, may have masterminded a Richard Nixon-like campaign of spying on Obama's political opponents, one that stretched back years before the presidential transition in which she has been accused. "I think it's going to be the biggest story," Trump told The New York Times on Wednesday, without offering any supporting evidence. "It's such an important story for our country and the world. It is one of the big stories of our time." The White House and its allies will try hard for that to be so. And making the story about Rice not only allows the White House to change the subject from what involvement Trump's campaign aides may have had in the Russian intelligence services' attempts to influence last year's election. It also brings along sometime troublemakers who are only too glad to have an old foe back in the arena. "Americans deserve to know if Pres Obamas National Security Adviser was involved in unmasking Trump transition figures for political purposes," tweeted South Carolina Sen. Lindsey Graham, a Rice enemy of many years. "In terms of political manipulation of national security information, Susan Rice — in my view — has done it in the past." Graham is the chairman of a Senate subcommittee that oversees the counterintelligence division of the FBI, which is investigating the potential ties between Trump's camp and Russia. He has called for getting to the bottom of that story — but Rice being back in the mix is apparently too rich for him to pass up. Graham and his colleagues pilloried Rice following the 2012 attack on the U.S. diplomatic mission in Benghazi, Libya, after she appeared on TV in Washington and said the deadly raid had been caused by protests over an incendiary anti-Muslim video. Republicans charged that Obama and his aides lied to protect his campaign-trail claims about having nearly defeated al-Qaida. The hounding was so intense that Rice asked Obama to withdraw her nomination to become secretary of state following the departure of Hillary Clinton. Instead, Obama made Rice national security adviser, a job within the executive office of the president and so without need for Senate confirmation. Rice remained a target, however, for conservatives and critics of Obama's handling of the Syrian civil war — and she also made enemies within the government over what critics called her irresolution and micromanagement. That may mean she enjoys few defenders from the Obama era or the current administration, although Rice was not reticent this week in firing back on her own. "I leaked nothing to nobody and never have and never would," she said on MSNBC. Rice called herself "shocked" when she saw Trump's post on Twitter that said Obama had "wiretapped" him — "It wasn't typical of the way presidents treat their predecessors," she said. Trump's post set in motion a sometimes baffling chain of events as the White House and its allies in Congress tried to make the president's charge be true. Strictly speaking, it isn't: FBI Director James Comey and the chairmen of the House and Senate Intelligence committees all say there was no wiretap of Trump. But when the dust settled, Republicans did reach ground on which they feel comfortable standing: Trump and his aides apparently were swept up in legal U.S. surveillance of foreign targets during the transition. Some of the names of the Americans involved may have been "unmasked" — revealed within secret channels so senior leaders with the appropriate clearances could see them. That's not wiretapping, but it's good enough for government work — and it has uncovered a rich vein for Republicans to mine as they respond to the Russia-meddling storyline. Majority members on the House and Senate committees could call Rice, or other people from her era, to testify as Democrats seek Trump campaign aides. And Republicans can talk in open hearings, and to reporters, about the Rice-unmasking narrative — not Russian cyberattacks or potential collusion with Trump aides.